Looking for "green" people in Tulsa, Oklahoma? "Our 1st Thursday! program is moving to a new location! We want to send so much gratitude and thanks to Foolish Things Coffee Company for using their beautiful space over the last few years. That has allowed us to grow our 1st Thursday! program, but we've now outgrown that space! Thank you, Foolish Things! Stay tuned for more details for each 1st Thursday event: http://sustainabletulsainc.org/subscribe/"
Every First Thursday: Join Sustainable Tulsa for a lunch time networking event with speakers showcasing their sustainable efforts. The group meets at Foolish Things Coffee Company to lunch and learn. 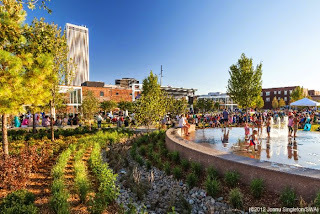 Every Third Thursday: Join USGBC Oklahoma for a happy hour at The Rusty Crane in Tulsa, Oklahoma to mingle with fellow green-minded folks (designers, activists, planners, citizens, recyclers, you, me, our friends plus construction, energy and environmental professionals, etc). Sustainable Tulsa and Green Drinks Tulsa will see you there! Green Drinks Tulsa is a volunteer run group working to connect the "green" of Green Country. Hop on over to Facebook to see what's going on in Tulsa and other news from around the sustainability community! This Saturday night, December 7th, enjoy a 5 course organic, local, fresh sustainable meal with new friends. I AM Chef Shane will lovingly prepare a meal using food from Three Fruits & A Veggie Farm, paired with Tulsa favorites like Girouard Vines and Mod's Coffee and Crepes. The event starts at 6 pm at the new I AM Studio, 1310 E. 6th Street. Tickets are available online for $50. This includes wines served during the 5 course dinner. 10% of all ticket sales go to Three Fruits and a Veggie Family Farms Kickstarter program to fund their very own family farm kitchen. Have a product, place or person you'd love to see in our 2014 spotlight? Let us know! Working on a green project, running a local business or yearning to learn about the green of Green Country? Come share what's going on! We are a volunteer run organization always open to new ideas and new people. If you are interested in helping plan an event, being a host location or suggesting ideas for future fun, we would love to have you involved. APRIL GREEN DRINKS: Happy Hour with Bill Roth and Sustainable Tulsa! Come Join Us for April Green Drinks! Bill Roth is a world renowned Sustainability Expert and Sustainable Tulsa has been working with him to create their Sustainable Business Series. 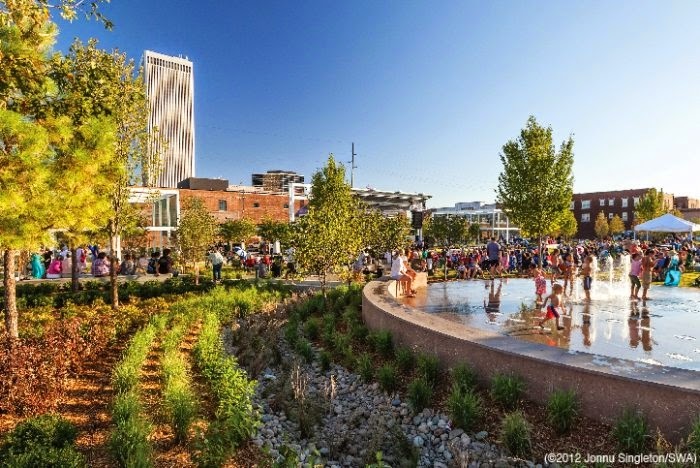 Green Drinks is very excited to host this event with Sustainable Tulsa. Come by Vintage 1740 before the CHIT CHAT Art Event at Treehouse on the corner of 18th and Boston. Please SHARE! New York Film Critic This Thursday in Tulsa!! So this isn't very "green" per say but it's really cool and if we want to keep bringing cool people to Tulsa, we have to support events like this. If you would be interested in seeing Green Drinks provide more speaking/educational events, please let us know! NEW YORK FILM CRITIC COMING TO TULSA THIS THURSDAY!!! Next up on the Synagogue calendar is "...Talking Heads" with A.O. Scott, Chief Film Critic for the New York Times. Scott will be at the Synagogue on Thursday evening, April 4. Tickets are ...$15 for general seating at $30 for preferred seating. *Special Pricing for Circle Cinmea Members and FREE for Teach for America folks!! The event will begin at 7:00 p.m. Call (918) 935-3373 for tickets. March 6, 2013 we'll be spotlighting Hodges Bend for another "no agenda, just drinks" happy hour, beginning at 7 pm. This will be an informal, laid-back get together and opportunity to try the fabulous creations, variety of coffee, wine and cocktails this new location serves. Come share a drink with like-minded folks; chat, connect, get inspired or just socialize. RSVP over at the Facebook event and like our page to stay connected. See you all Wednesday, March 6! Have a product, place or person you'd love to see in our spotlight? Let us know! Working on a green project, running a local business or yearning to learn about the green of Green Country? Come share what's going on!